Jon Dron and I have been having fun developing a paper for ELearn in which we’ve been wrestling with the distinctions between three granularities of social software. In the process it has helped me to clarify Stephen Downe’s distinctions between groups and networks, the way that certain tools seem optimized for different levels of these granularities (for example blogs are better for networks than for groups) and it has helped us to create a rationale for use of collectives in formal education. 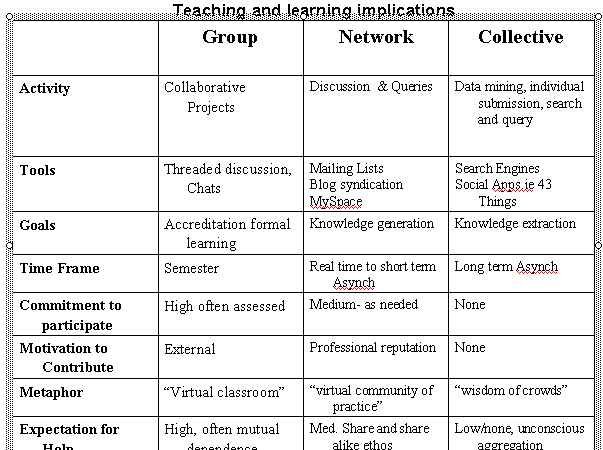 Jon has defined the three granularities of Social Learning 2.0 in a recent blog posting. In this post I provide graphic overviews of the three followed by a table comparing the three applications for educational use. In the following table (click to enlarge) we attempt to categorize the three levels according to a variety of educational concerns. We are most interested in hearing from you if these granularity ideas, graphics and table help or hinder your understanding of new networked tools and contexts. Is collective the right name? I think that these debates about groups, networks and software that supports them are really useful (thanks Stephen Downes for pointing mw to this post). That said, I think your categorisation above is a little mixed. Your definitions of groups and networks seem to be about people and their behaviours whilst the third is a mix of behaviours and software. I think the main problem in your definitions and model is the lack of “social”. I think there are levels of trust and social connection that happen at each level that are not captured in your terms or model. I agree with the three levels and even looking at the individual-group interaction as a way to identify those levels. In fact, this is an area that I am currently studying myself in terms of learning and writing. I agree with Frances, however. It is not the technology or software per se, but how they are used. Even within the blogging software, for example, some blogs allow for more two way discussion than others (look at Vicki Davis’s blog for example, for a two way discussion). Likewise, social software like myspace was originally set up as a presentation software, but soon users manipulated it to be used as a way to make social connections. I think your table needs a section on emotional or relational depth, and your descriptors should be limited to a description of the attributes of the technology (i.e. allows for two way communication, allows for data-mining, limits user design input, limits outside connections-such as gmail uses invitation to develop its clients). Frances is quite right about collectives being a blend of software and people – it is precisely this cyborg nature that makes them so interesting and different from earlier forms. There is no doubt that any decently constructed social software will exhibit characteristics of a deferred system (i.e. the ‘design’ continues after the software developers stop) and most can be bent to many purposes. The mapping of these different modes of The Many to specific software is consequently loose and tractable but, following from what Virginia writes, it is not unreasonable to look at affordances of particular tools to support these different kinds of groupings as well as to see how they are currently used in practice. I think that it is quite useful to have a model that lets us talk about those affordances, rather than muddling through with vague concepts that were suited to an age of CMC but which don’t quite capture the richness of modern social software. I agree with the emotional/relational depth idea and we have talked about this elsewhere -there is a continuum that I think may start with focussed teams, followed by groups, networks and collectives through to unconnected publication along which all these systems lie, with ever weaker ties between individuals as we make our way along the chain.